The Days Hotel is no longer for sale. Please see our Luton Airport hotels for other great offers. 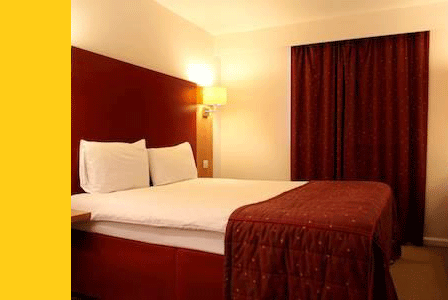 The comfortable and very clean Days Hotel is a popular budget hotel, and its easy to see why. Its a 10-minute drive from the terminal and has everything you need - and a few little extras too. The staff are friendly, efficient and will help you in any way they can - and of course theres the fantastic price. If you just want to get your head down, but enjoy a good meal before you do, then this is the hotel for you. 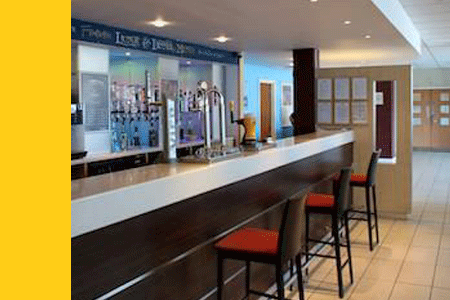 The light, open-plan ground floor houses reception, the restaurant and the bar, which is open from 11am and has a plasma TV showing Sky Sports. Its very quiet during the day, but is a hive of activity, full of excited holidaymakers, in the evenings. Theres a sheltered smoking area outside the front of the hotel, with tables, chairs and plants. Theres free wifi on the ground floor, along with an ironing room, a cash machine, and a fax machine and photocopier at reception. There are also safes at reception which guests can use for free. Although the hotel has no leisure, guests can pay to use the health club two doors down, which has a pool, jacuzzi and gym. Budget-conscious travellers - If you want a place to rest your head before you fly and dont want to pay too much for it, this is the hotel for you. Breakfast lovers - Breakfast is delicious, theres loads of it and its a bargain at £9. Parking - If you need somewhere to leave your car while youre on holiday, you can either choose on-site parking in the multi-storey next to the hotel, or the popular Airparks car park. My only quibble is that the map of where the hotel was was not very useful; apart from that, everything went incredibly smoothly (the hotel even offered a 20% discount on food that had not been advertised), the description was fine and the staff were helpful. The service was very efficient and certainly as it was described. 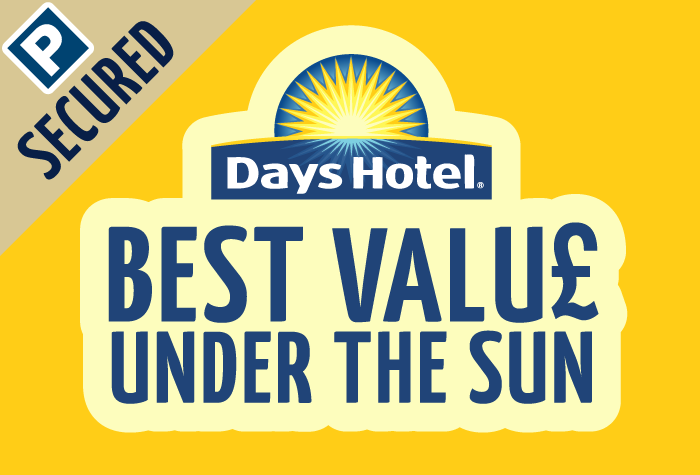 Our customers rated Days Hotel on average 8/10 (3 reviews). Read Days Hotel reviews. The Days' parking: Park your car in the Days' car park overnight. 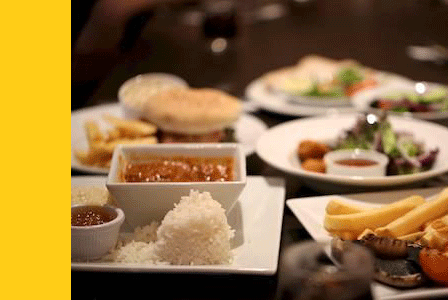 The dish of the Days: If pub grub and a vibrant atmosphere are in order, then you'll be in the right place. 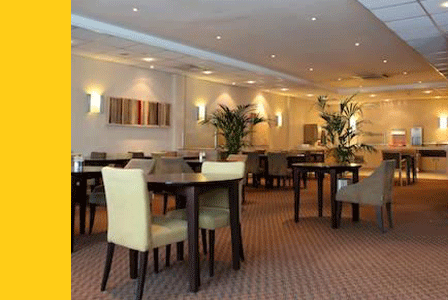 The hotel's restaurant serves family favourites at very reasonable prices. Good Days, great nights� sleep: The bedrooms are clean and functional, with beds which are bigger than a standard double and really comfy, with crisp white linen and large sink-into pillows. The soundproofed windows and blackout blinds make it very easy to get what you need from this room - a restful sleep. The most important meal of the Days: Fill up on the Days' buffet breakfast before you fly. It's super-tasty, there's tons of it and you can go up as many times as you like. Ready for the Days ahead: Woohoo, it's the day of your holiday. Take your car to Airparks on the morning of your flight, they'll park your car and transfer you to the airport. The Days here, time to come home: Jump on Airparks' transfer bus back to the car park. Your car will be ready and waiting for you. Disabled facilities The hotel has six accessible rooms for disabled guests. These have wider bathrooms with wet room showers, emergency cords and grab rails. All accessible rooms interconnect with a twin room where a carer can sleep. Flashing fire alarms and vibrating pillows are available for guests with hearing difficulties, and the hotel has a hearing loop. Guide dogs are accepted. There are disabled parking spaces in the multi-storey car park.